A weekend not too long ago, Mum, Rebecca and I ventured to our holiday house by the beach. On the way, I used the time to write. Knowing I’d been a little overwhelmed at work lately, Bec hollered to the back seat ‘are you working or playing! ?’ Knowing all too well what she was talking about, I assured her I was ‘playing’, that is, blogging and planning all the goodies that were to be baked that very weekend. The weather was typical Melbourne weather – cold and rainy. Luckily, this was perfect for all the coffees, lazing in front of the heater and watching of movies that was on the agenda. And it gave me some downtime to make something delicious I could share with you. That’s where these cakes came in. Although the health-conscious girl in me would often say icing and toppings are optional, you mustn’t forget the glaze for these cakes. The burnt butter creates a super caramelly flavour too delicious to skip. Even for all you lactose intolerants, remember, butter is very low in lactose so don’t be afraid to use a little in baking! 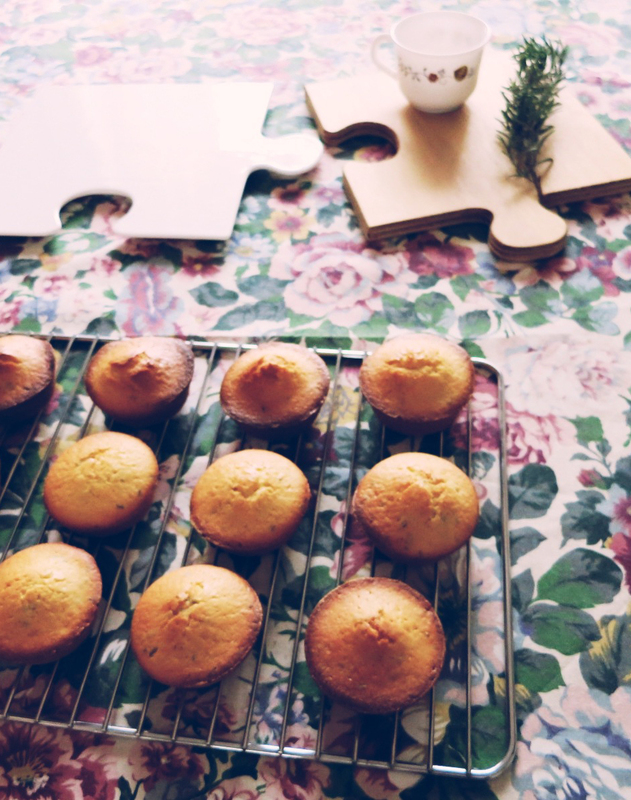 To make the cakes: Preheat oven to 180˚C and grease a 12-cake muffin tray well. Combine flour, almond meal and salt, then set aside. In a separate bowl, whisk eggs slightly then whisk in sugar til the mixture thickens. Add the olive oil and continue to whisk until thick and pale. Add vanilla, rosemary, zest and juice, and stir thoroughly. Finally, add the dry ingredients and whisk until smooth. Spoon mixture evenly into tray, making each cake about ¾ full. Bake for 30 minutes or until the cakes are golden brown and springy to touch. Allow the cakes to cool for ten minutes in the pan, then gently remove and allow them to cool completely on a rack. To make the glaze: While the cakes cool, place chopped almonds in a small saucepan to toast. Remove almonds and set aside to cool. Using the same saucepan, melt butter on medium heat and allow to bubble. When the bubbles subside, lower the heat, swirling occasionally to distribute the heat. Watch this carefully and turn off the heat when the butter begins to turn a tan colour and smells caramelly. Allow to cool slightly then add sugar, cornflour, milk and lemon juice. Stir until smooth and slightly thickened. If too runny, add icing sugar til you’re happy with the consistency. Spread over cooled cakes, and top with toasted almonds.